You're probably a little tired of park pictures by now, but I'm laid low with a cold. I'll be back out with my fresh eyes in a couple more days. Mo, thats such a beautiful photo! love it! Best cure for a cold is a walk in the park. I'll never get tired of park pictures and I agree with billyB, a nice walk there might work wonders. Get well soon. I'm into swans at the minute, so this is a treat. Are you dousing yourself with Vit. C? Get the buffered powdered/crystalized version and have 1/4 tsp every few hours. I could never tire of such gorgeous photos! Swans are so beautiful - I could never tire of them. I hope you feel much better soon - keep warm! I could never get tired of park pictures. Feel better soon!!! Those swans sure make swan life seem easy and relaxing! I wonder if they're paddling like heck under neath the water's surface? That's a soothing picture for sore eyes. Great exposure. I've never yet snapped a swan without burnt-out highlights! Hope you feel much better soon. 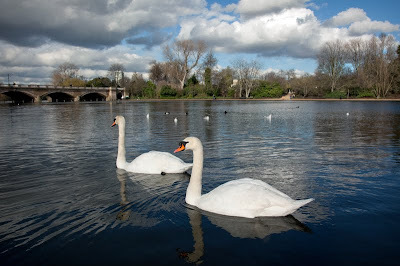 Like everyone else, I never tire of park or swan pics - especially great ones like this! Lovely photo! So serene. I hope you feel better very soon! nice shot , hope you're feeling better ! So graceful, I must try & take a pic of our black swans! Chicken soup with lots of garlic - get better soon. Aaaah, I hope you get better soon, Mo. This is such an exquisite shot with the graceful swans against the angry sky - how could I ever get tired of your park pictures? !